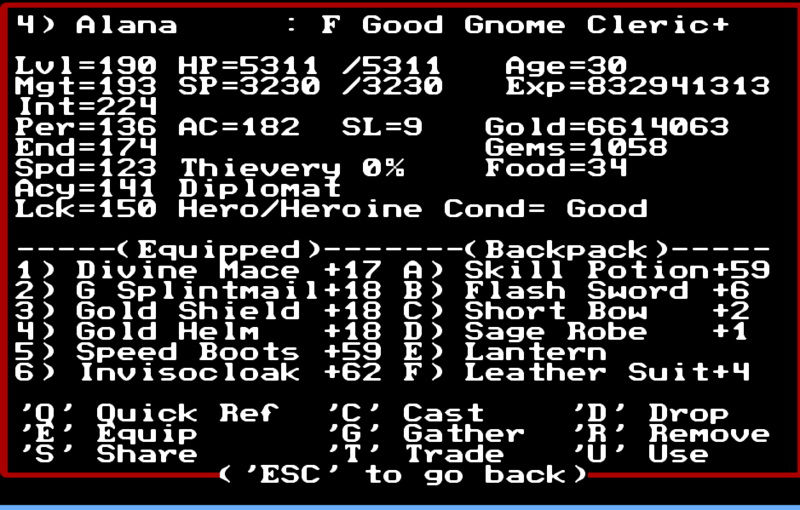 I was one dungeon away from completing the game last time, but by now, it was obvious it would take a lot of grinding or potion abuse to get past the last major battle. This is exactly what I did. The first thing I did was to go to Dragon’s Dominion and kill a few Ancient Dragons. This got me some more money and by now, I was swimming in it. I was also gaining between one and two levels for every dragon I killed. Not for a while yet. 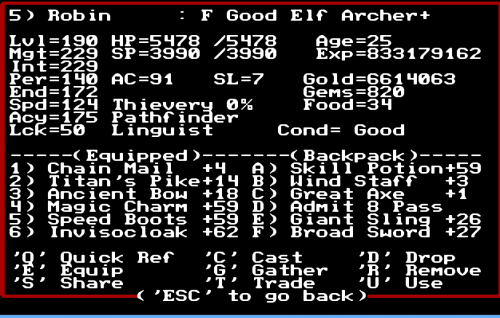 Then I realized I have way more money than I’ll ever need and I risk loosing it all in one unlucky random fight. 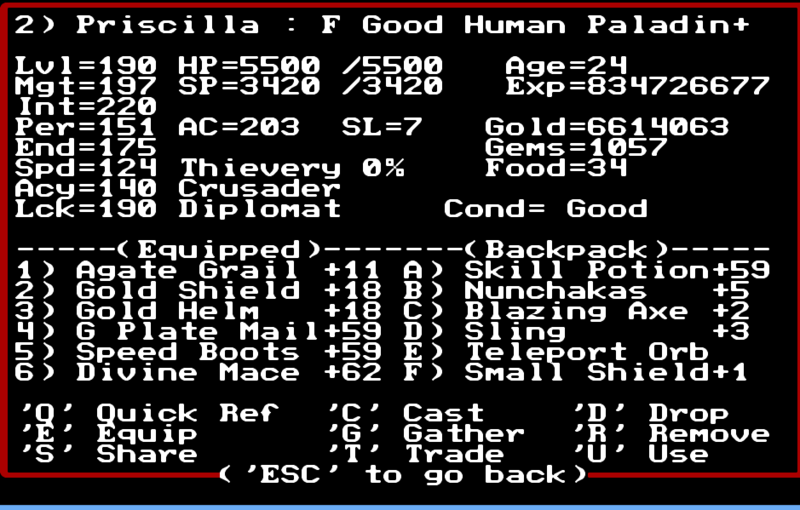 Because of that, I looked through my notes and found a few of those places where you can trade gold for experience. One of these places, two levels bellow Hillstone Castle, did this trade at a ratio of 3 to 1. 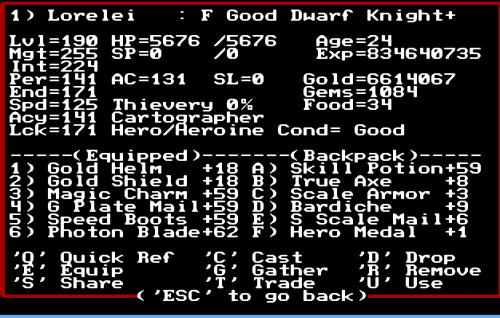 In a single move, I went from level 30 to about 50. Then I used Google and found my next objective – Cuisinarts. Cuisinarts are monsters with extremely high speed and damage, but also an extremely high experience value. I was pretty sure I could kill a couple of them before they kill me and there was a fixed group of 3 in B1, 1-9, where I already met them during regular exploration. 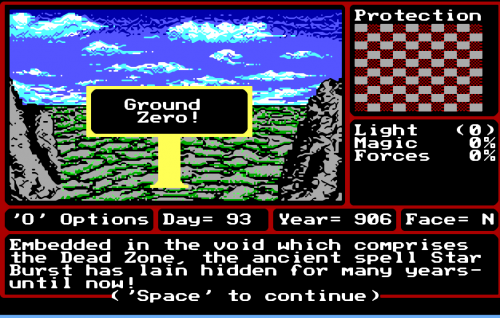 Trick to getting Star Burst out of Dead Zone is Nature’s Gate on day 93. This group, according to my calculations, is worth about 60 million experience in total, valuing a single Cuisinart at 20 million experience. I used them to get all the way up to level 130 or so, alternating between them and ancient dragons for when I lacked gold. Why did I do this? Because using experience fountains doesn’t work with hirelings – they don’t carry gold. 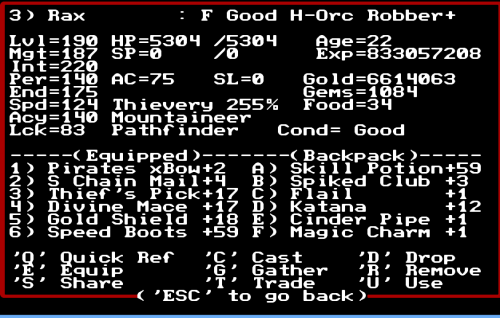 During all of this, a bunch of items I was looking for dropped for me. I got a Divine Mace for my cleric and paladin. 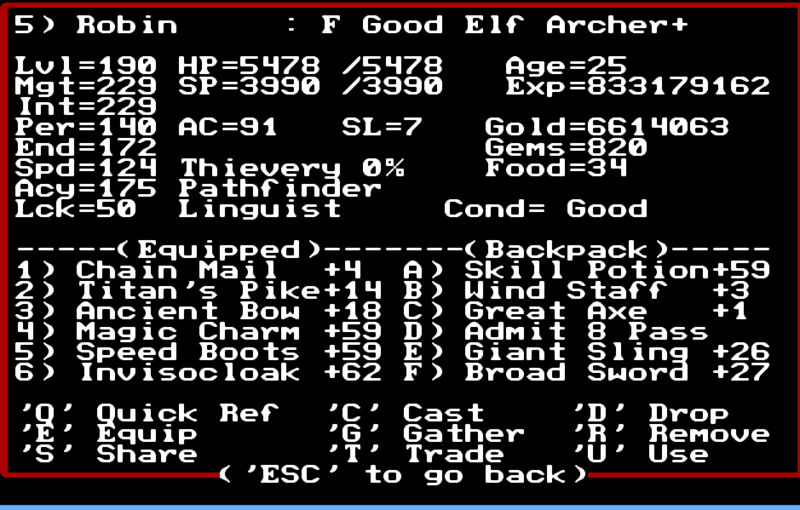 This weapon has a nice base damage value and provides bonus AC, which increases with enchantment. I already had a Gold Plate, Shield and Helm so that part was covered, but a Gold Splint Mail also dropped now, so my clerics were covered from head to toe in gold. Some other items also dropped, but the most important part was that I was able to enchant them even higher, now that my SP pool was bigger. 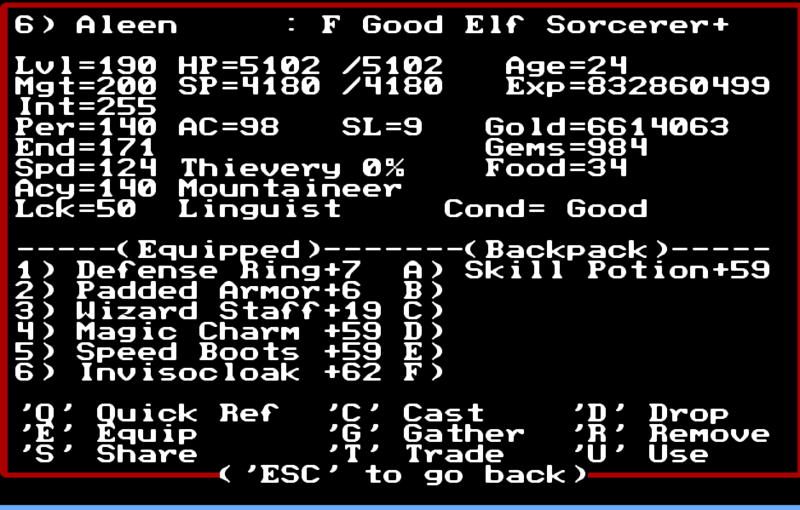 You see, Enchant Item has a gem and SP cost and the SP cost depends on how high you’re enchanting the item. To increase an item enchantment level by one, it requires 50 base spell points, as well as 50 additional spell points for each enchantment level the item already has. 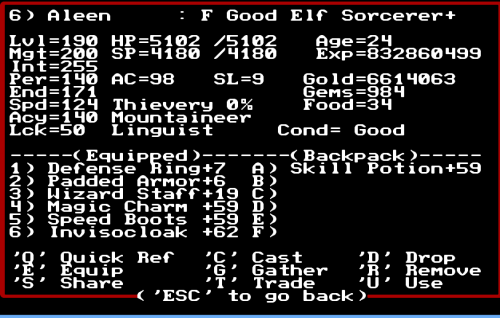 For example, to enchant a +10 item to +11, you need 50 plus 10 times fifty, or a total of 550 spell points. Aleen’s SP maximum was at around 3000, so I was able to easily get any item I wanted to +60, as long as I had the gems, the time and the patience for it. For gems, I could easily go to the Gem Maker’s Cave to get another 500 every time I wanted, so that wasn’t an issue. Concerning time, my notes tell me the world will end in year 1000 and it was year 905, so again, that wasn’t an issue. The only issue was patience, and I was quickly running out of it. I spent probably a couple of hours enchanting and training and then gave the Square Lake Cave one more try. A eureka moment that helped was when I realized you could duplicate and enchant potions. I enchanted a Skill potion to +60 and gave each party member a duplicate. Since it had 60 uses, I was confident I wouldn’t need more than one per character and I was completely right. Two uses upped everyone’s level to the maximum of 255, making magic and regular attacks extremely powerful. Even so, the battle against 66 Devil Kings was not easy. 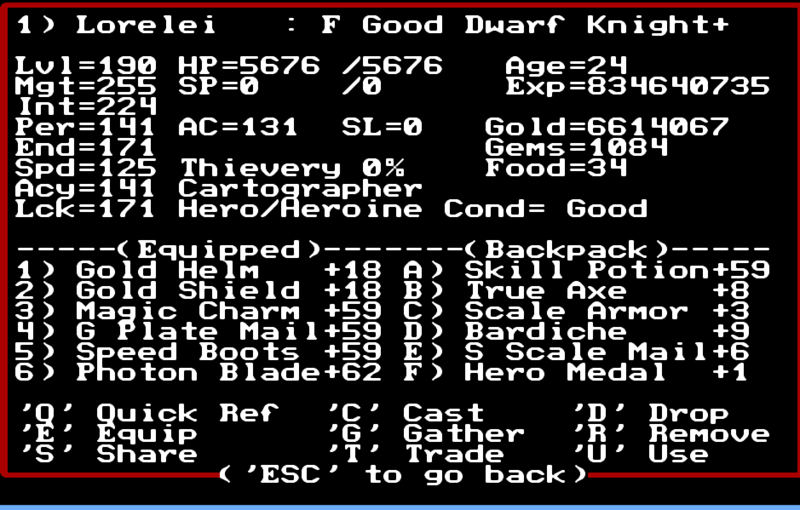 I ran out of spell points half way through and was forced to use melee and simply heal through the damage. 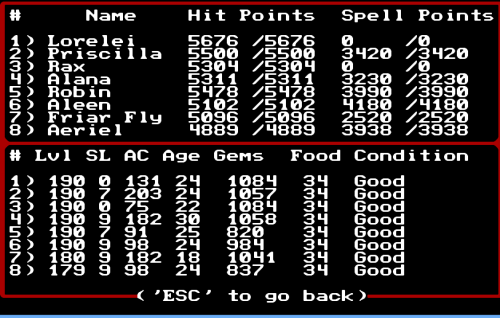 I managed to defeat this group and then completely obliterated Sheltem and his four elementals. 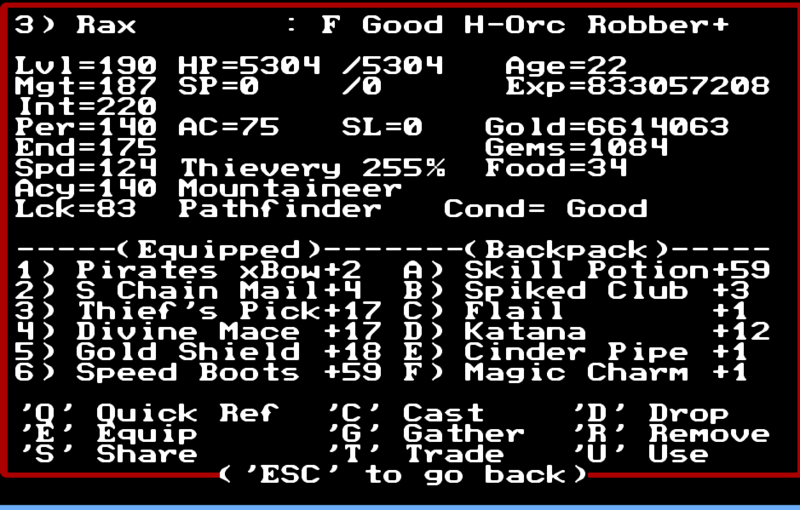 I’m not sure is this is a bug or a feature, but random strings from the game are displayed before the final fight. There was a warning that CRON and all of the VARNs are on a course towards the Sun and I was required to input the code that the King gave me – WAFE. This sort of worked, but then Sheltem gave me one last obstacle – I had to solve a cryptogram within the time limit. I failed this one, but the screenshot helped me solve it. First and foremost, the last time I had any experience with a cryptogram was in elementary school, while reading a children’s novel. I actually had to use Google to make myself remember how it even works. Secondly, it’s in English and it’s way easier to solve these puzzles in your primary language. Basically, the time ran out. The code was told to me by the King. Luckily, I was smart enough to take a screenshot, so I had all the time I needed to figure it out offline. The goal was to use the deciphered text to encrypt the provided answer, Preamble and input it to the console. The victory screen. I love the sci-fantasy world this series created. I went through the entire cave one more time, got through the fights and was at the console again. For a moment, I got scared, because the cipher text was different. Luckily, it decrypted into the same lines, so all I had to do was to encode the answer using the new cipher. I made a mistake once, but managed to do it right on my second try, before the time ran out. 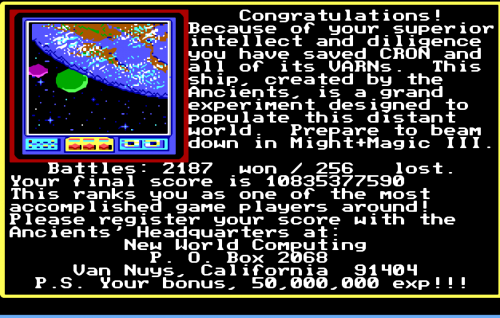 Because of your superior intellect and diligence, you have saved CRON and all of its VARNs. This ship, created by the Ancients, is a grand experiment designed to pupulate this distant world. Prepare to beam down in Might and Magic III. Might and Magic II ends similarly to Might and Magic Book One. I got a score, some statistics and a mostly meaningless (but nice) experience reward. I was back at the main menu with my party at Middlegate Inn. I loaded the game and went to train with the experience I got. 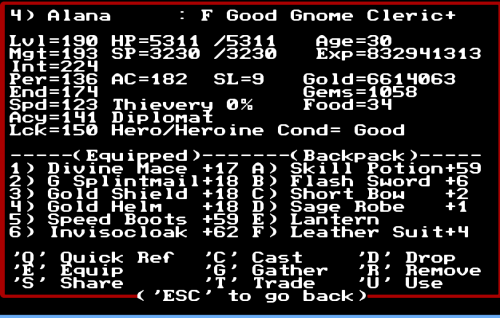 It was enough to get my six characters to around level 190. 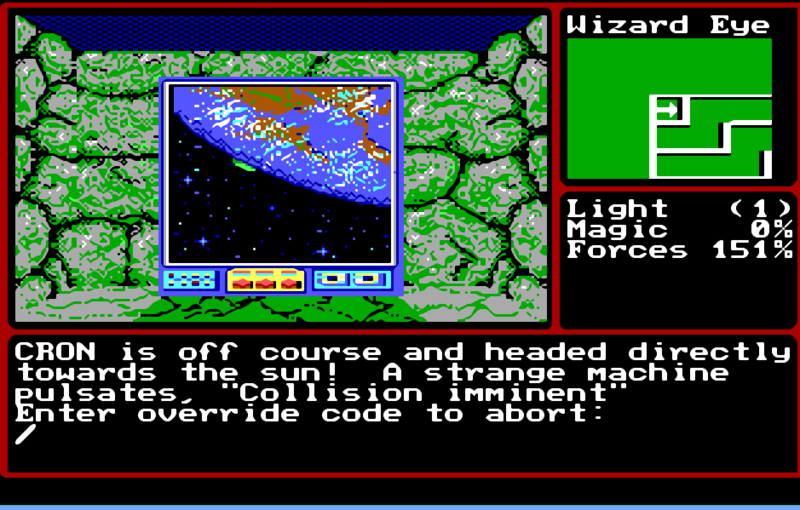 I’m a bit worried about Might and Magic III. From what I hear, and from what I can remember, it’s a very different experience compared to the first two. The final state of the party, after winning the game. That being said, I have some complaints about Might and Magic II as well. I dislike the level scaling. It serves no purpose. The difficulty of the game doesn’t really increase. It might increase if you somehow abuse experience sources without actually investing the time to gather equipment, but as it is, it just increased the tediousness. 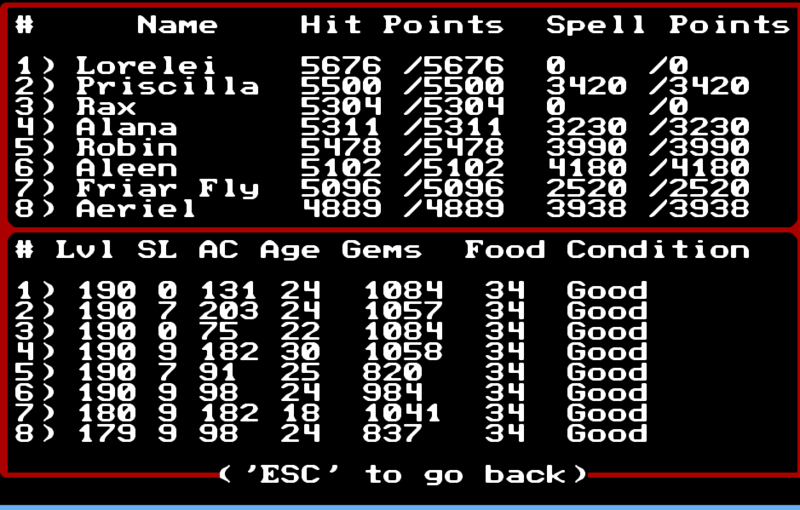 Level scaling in Might and Magic II works in two ways, it seems. It looks like it causes you to fight stronger monsters instead of weaker ones. Where you fought goblins at the start of the game, you now fight dragons. Additionally, it tends to add a large group of low-level monsters to almost every random battle. What this means is that in almost every fight in late game, you get to kill a couple of demons, or warbots, or something like that, but you also get to kill about 200 kobolds, who tend to summon reinforcements in the form of about 100 more kobolds. It’s not difficult, it’s not clever, it’s just tedious and annoying. I dislike the jump in difficulty. 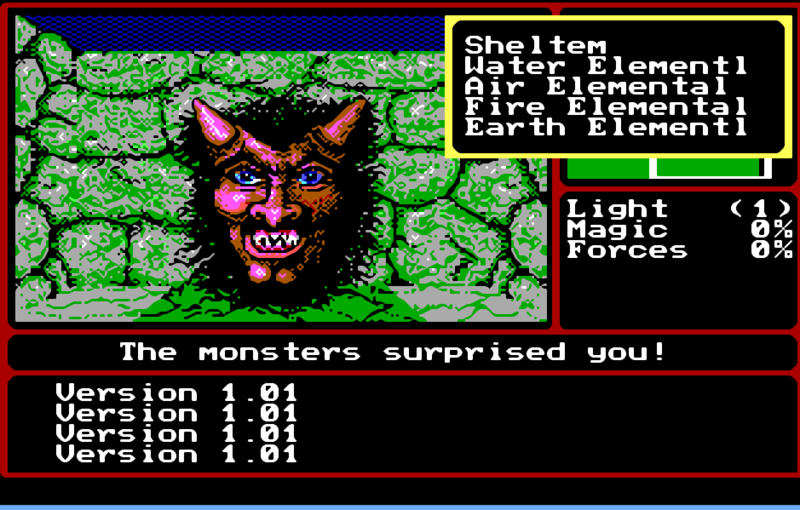 The progression in Might and Magic II is not linear. You play through parts of the game where the challenge is very appropriate and then you suddenly hit a wall, where you have to grind or train, or find gear. Now generally, I don’t mind this approach and often actually like it. The thing is, before the final dungeon, the jump is so huge, you basically need to max out your characters and make them exponentially stronger before you can complete the game. This definitely wasn’t the case in Secret of the Inner Sanctum. The Astral Plane was difficult, but it wasn’t a huge jump from the previous areas and it allowed you to train within it to get strong enough to beat it. The Square Maze was different. 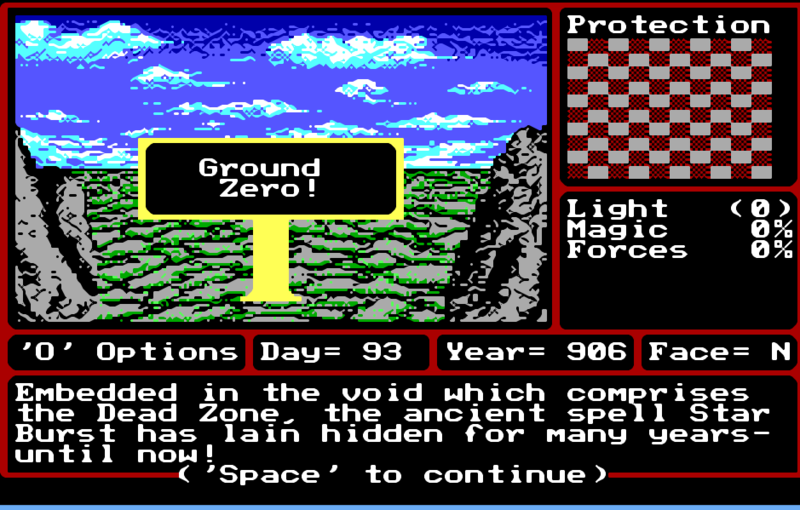 It forced you to grind through and you had to get really lucky to get out alive if you hit a tough group of enemies. The final group is simply impossible with a regular-level party. You have to grind, and you have to do a lot of it. Overall, though, I loved Might and Magic II. It retains most of the charm of the first game, greatly improves on the experience and only looses slightly with the scaling. 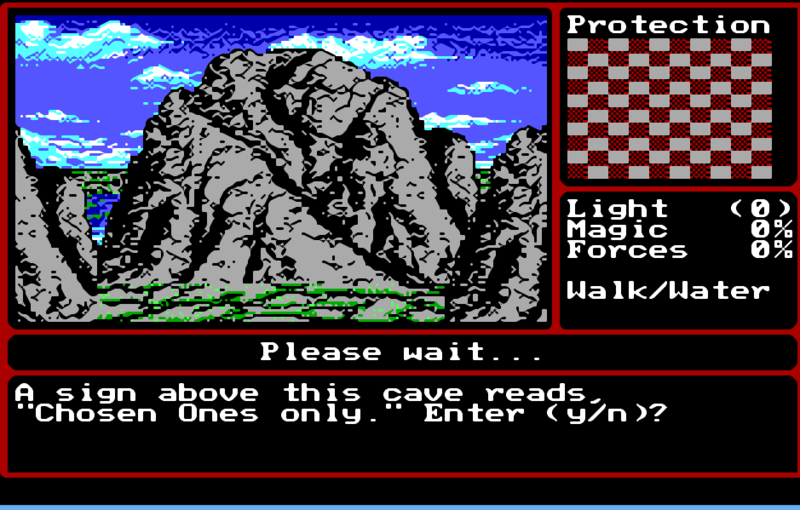 Not Might and Magic III, that’s for sure. 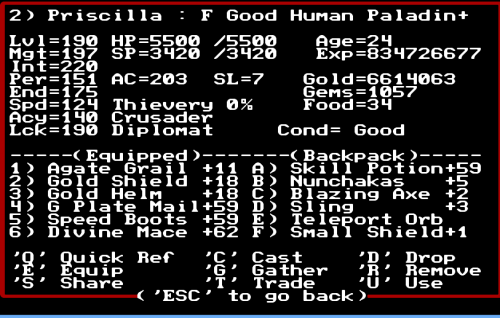 I’m a bit burned out with this type of CRPG. I think I’ll go with a STEAM game next, possibly even one of those you never really complete. I also intend to compile some of my notes and maps into a sort of guide. It won’t be as all-encompassing as those I have for Secret of the Inner Sanctum, but there are some things I wanted to write about that I find a bit inadequately covered in the guides available online. I will also be reading a Let’s Play from the Let’s Play Archive – Might and Magic Book Two by Thuryl. Thanks to Keith Douglas, I now know that the fight against the devil kings is completely optional. Apparently, the group bows down to you as the chosen one and you have to go out of your way to confirm you want to fight them. I wasn’t paying attention, so instead of dodging the fight, I spent a lot of time grinding up my experience levels in order to beat them. Serves me right for not paying attention. Might and Magic Book Two  – Dragon’s Dominion is hard! Might and Magic Book Two  – Too many things!